_____The 60's and 70's were two of the most exciting decades in Wildwood's history and throughout those many summers the vast beaches were always packed with happy vacationers, local residents and day-trippers alike. The kitschy motels and restaurants thrived as did the boardwalk which continued to thrill everyone with more and more first-rate amusements and custom attractions. The Pacific Avenue strip bustled with business 7 days a week and after dark the nightclub scene exploded with big name entertainment that rocked the island into the wee hours of the morning and no one covered it all like SHOUT - hands down, the best summer guide to fun at the shore. _____It began with college buddies, Richard Bonelli and Dennis Grant. The idea for the paper came to Bonelli after hearing from one of his fraternity brothers about a town in Puerto Rico he had just visited that had boxes placed throughout it with free newspapers in them. Bonelli had never heard of this and was thoroughly intrigued, thinking this might be something that would work well back in his hometown of Wildwood, New Jersey. _____He then approached Grant with the idea of starting a weekly summer paper (running late June through early September) that would cover all the events happening at the Jersey shore and for a small fee they would provide advertisement along with a professional write-up for local businesses. At that time Grant had never been to or even heard of Wildwood yet he loved the idea, so in the summer of 1962 he accepted Bonelli's invitation to stay at his family's home in Wildwood and the two friends set up their headquarters on the first floor and readied for launch. _____Their first big decision was to choose a name for their paper. That year Joey Dee and the Starliters released a cover version of the song 'SHOUT' (originally recorded by the Isley Brothers in 1959) and they both agreed it was the perfect name to reflect what they wanted their paper to do... Shout! Next they established the format - Bonelli would do the writing and editing while Grant would act as publisher and handle sales. 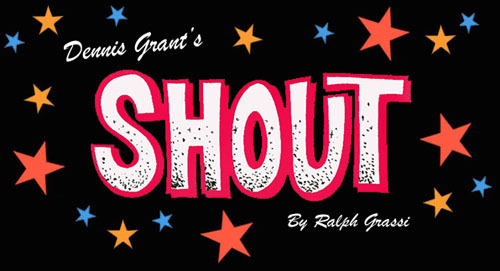 Needing an illustrator, Bonelli called upon his long-time friend Steve Kaplan who created the artwork for SHOUT for only a few years before leaving to attend the Philadelphia College of Art. In that short period with the paper he had created so many random illustrations and cartoons that he remained listed as head illustrator even after his departure and his work was used in every issue through Grant's ownership.